When at proper levels in the body Candida helps with digestion. When your body’s natural bacterial balance is upset, the candida grows out of control, creating a systemic problem. If your immune system is functioning optimally, this type of infection is rarely serious, but if it’s not the candida can migrate to other areas of the body. It sounds a little scary, but you may not necessarily see visible signs of an infection, many candida symptoms can easily go undiagnosed because it tends to affect each sufferer differently. Research from Rice University (USA) shows that 70% of all people are affected by Candida. Luckily Candida overgrowth can be easily managed with four key components: diet and exercise, bacteria, chemical exposure, and emotional & psychological issues. Making simple and small changes to your diet is the easiest way to tackle candida overgrowth. Here I’ll cover the foods to avoid further digestive track inflammation and the foods that will help detox and rebuild your digestive system while starving the candida. The Candida diet is a low-sugar, anti-inflammatory diet that promotes good gut health and eliminates the sugars that feed a Candida overgrowth. 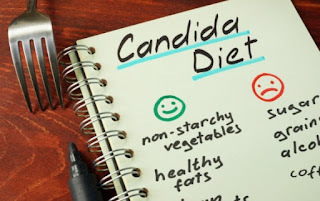 By removing particular foods from your diet for a couple of days/weeks, you can make significant headway in your fight against candida overgrowth. The candida overgrowth diet includes non-starchy vegetables, low sugar fruits, non-glutinous grains, healthy proteins, some dairy, low-mould nuts/seeds, herbs, spices, condiments, and healthy oils. When trying to recover from candida overgrowth, some foods will either feed or inflame your condition and so should be avoided. These include starchy vegetables, sugar/sugar alternatives, alcohol, grains, high-sugar fruits, and processed condiments. 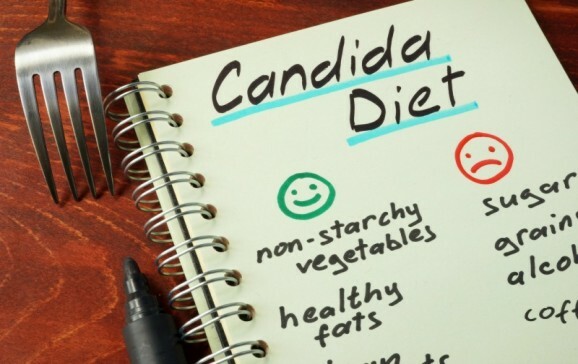 A Candida elimination diet will likely involve some significant changes in your lifestyle, but it can be made much more challenging by something called Candida Die-Off. When large numbers of yeast and fungal cells are rapidly killed, a die-off occurs, and toxins are released into the body. To cause an adverse reaction requires a very substantial change to your diet as die-off happens when the toxins released from dying candida overwhelm your bodies ability to flush them out. Substantial changes that might cause die-off come from drastically changing your diet, increasing your dosage of probiotic or antibiotics. The symptoms of Candida Die-Off are sometimes compared to those of a common cold or seasonal allergies but can be quite different from person to person. Individuals with digestion issues such as bloating, gas, constipation or diarrhoea tend to suffer more from candida die off symptoms. Your body will take some time to adjust to a candida diet, the use of a detailed health diary and food journal can help tremendously with the identification of patterns and responses. If you are having severe symptoms, there are a couple of important things that you can do. To stop the liver from being overwhelmed. · Cut back or temporarily discontinue your antifungal supplements. · Reduce your dosage of probiotics. · Increase water intake to flush out the toxins faster. Slow down and rest as much as possible.